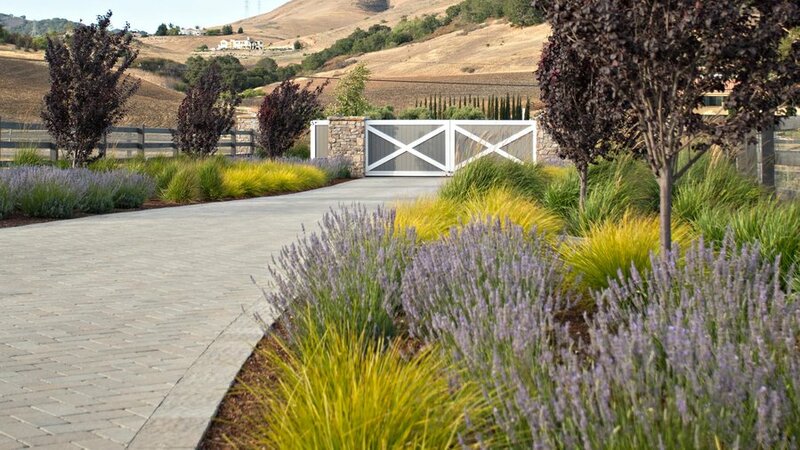 This expertly-designed driveway weaves low-water, pollinator-friendly ‘Provence’ lavender (Lavandula angustifolia 'Provence') amidst backdrop grasses like Lomandra Longifolia ‘Breeze’ and Calamagrostis Acutiflora ‘Karl Forester’. Designed by Addison Landscape, the planting plan also adds a consistent pop of purple with plum trees (Prunus cerassifera ‘Atropurpurea’), bringing it all together. Who says you need vast space for a delightful driveway? Beth Mullins paves the way for beauty with long, slender planters packed with succulents, lime green grasses, and a trio of trellised vines. Framed by symmetry, this compact garden perfectly complements the stone driveway. 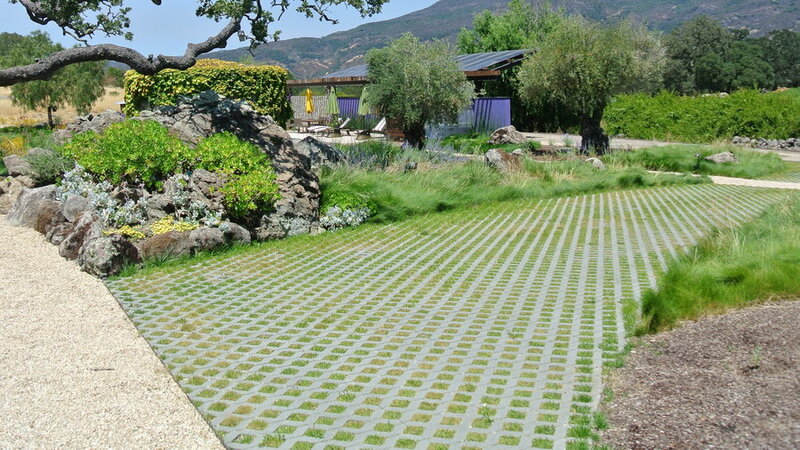 Sometimes a few lines of color can go a long way when working greenery into permeable paving. 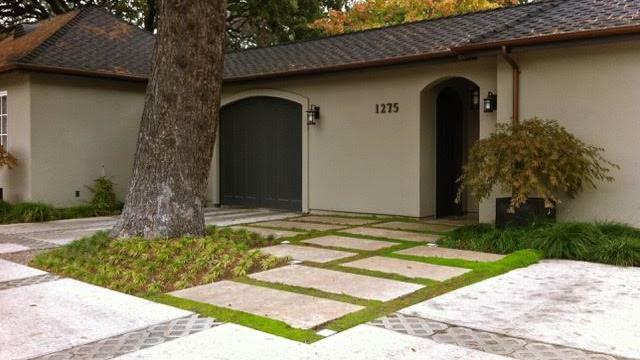 Chris Jacobson of Garden Art Group designed this Menlo Park driveway with hallow pavers, making way for water to feed the adjacent tree and strips of Baby Tears (Soleirolia soleirolii), an attractive, moss-like groundcover. 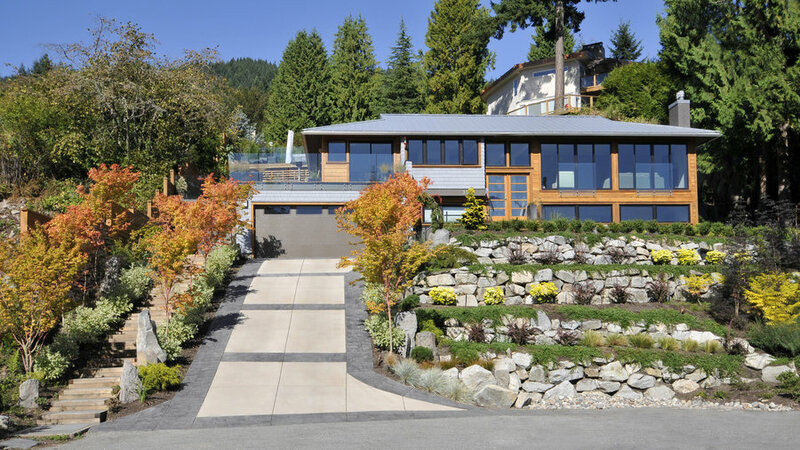 This Northwest wonder guides the eye to surrounding hillsides with its patterned, permeable driveway. Framed by a gravel path and a rock wall, the design blends water-wise functionality with pastoral character. 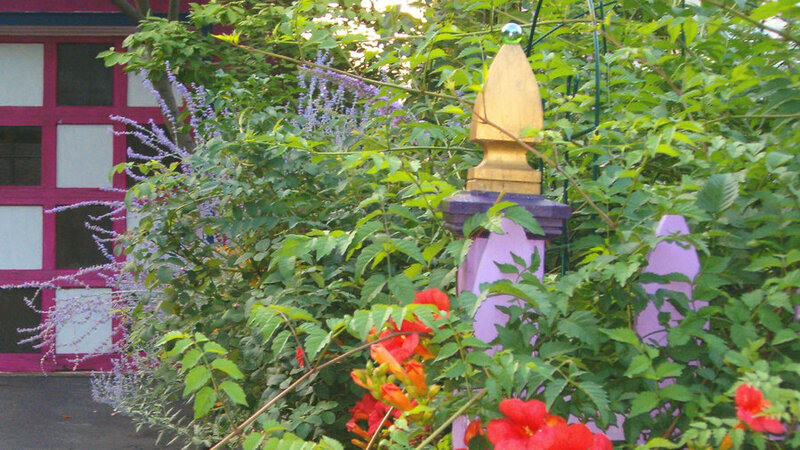 The low-maintenance fescues also create a lush, low-maintenance border. This suburban driveway greets guests with a whole lot of fun. 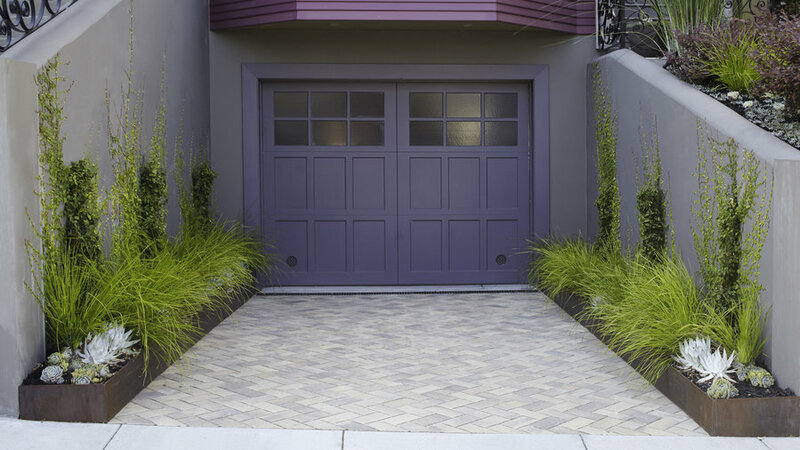 Between its eclectically-colored garage door, vibrant ‘Trumpet Creeper’ (Campsis radicans) and purple salvias, it goes all in on lush, lively color. These orange-red flowers come with vines that climb up to thirty feet, so be ready for regular pruning and watering. Homes with vast acreage can make a front yard come alive with groves of lavender. 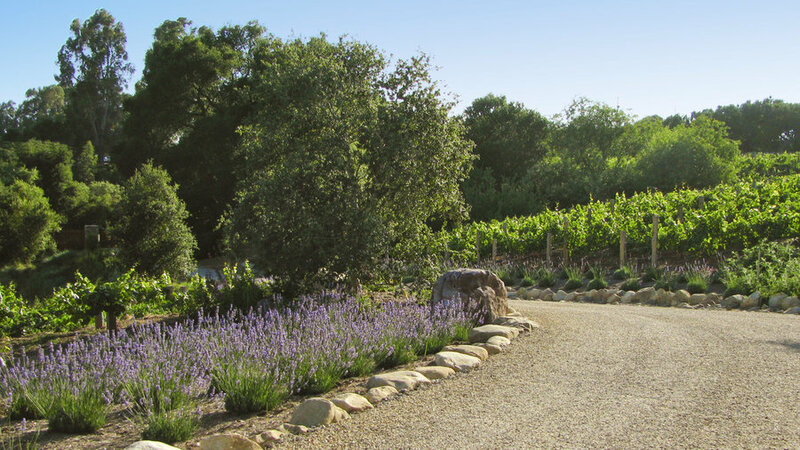 This decomposed granite driveway features a both pollinator-friendly border and a thriving vineyard. Fragrant and edible, lavender easily pairs beauty with function. This front yard creates a warm and inviting look with verdant trees. A grand Japanese Maple (Acer palmatum) sits to the left, while a purple Cercis canadensis 'Forest Pansy' adds a nice pop of color. This garden also brings in texture with a bold agave beneath an ornamental cherry tree and clusters of Foxtail Fern (Asparagus densiflorus 'Myers') along the front door. 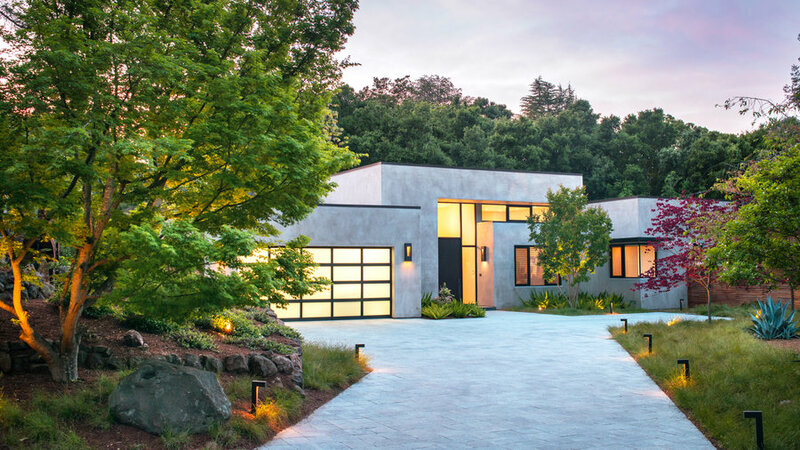 Between its clean lines and bold color, this home lights up the driveway with autumn-turning Maple trees (Acer palmatum). Its shrubbery-studded stairway and rock wall also bring plenty of color to the attractive, symmetrical design. Lawn lovers can keep the all-green look going and still stay water-wise by planting fescues. This drought-tolerant perennial produces neat mounds of fine leaves and is generally maintenance-free aside from an annual spring raking. 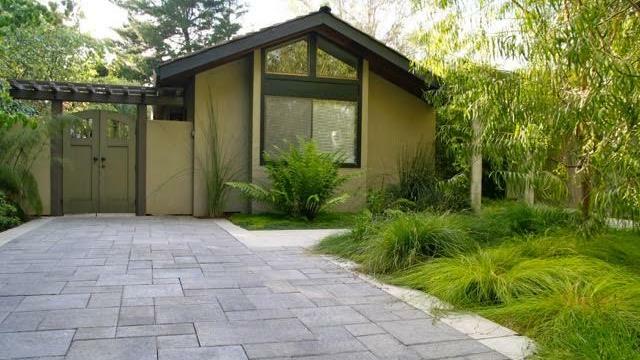 Moreover, its wild, natural look balances the clean, stone squares of this lovely driveway. Brimming with color and texture, it’s hard not to stare at this hillside scene. The water-wise driveway garden comes stacked beautiful agaves and succulents. 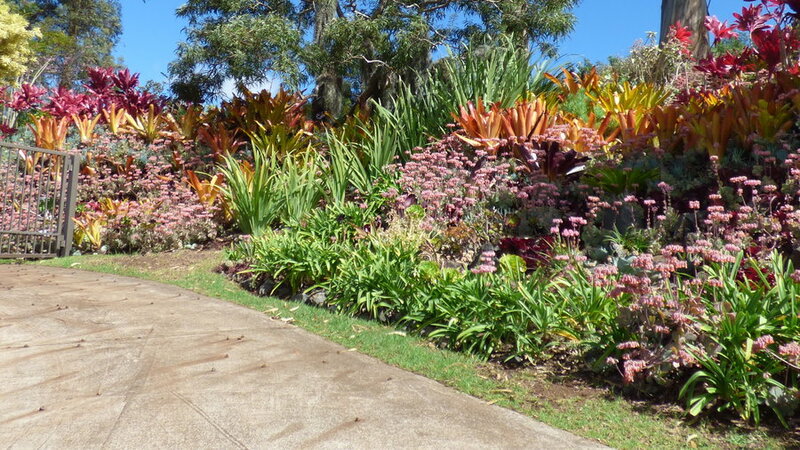 Established for a number of years, the terraced yard shows off various phormium varieties and blankets of blooming kalanchoe from top to bottom.